Dili, 13 Oct (Lusa) - The 7th Government - The 7th Timorese constitutional government, minority, faces next week in Parliament the first great test with the debate of the Executive program to be able to condition life in the country by the middle of 2018. 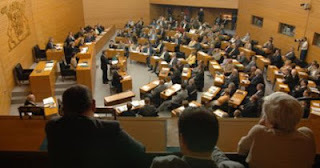 A possible lead of the text, which requires two motions to reject the opposition that controls 35 of the 65 seats of the National Parliament, implies the fall of the government, which took office a month ago, and opens the scene to possible early elections, conditioning the next year's state budget and the political stability of the country, in accordance with the legislation in force in Timor-Leste. The three remaining parliamentary forces, the National Congress of East Timorese Reconstruction (CNRT), the People's Liberation Party (PLP) and the Liberation Party of Timor-Leste (PLP) Kmanek Haburas National Unity Timor Oan (KHUNTO), were constituted in block of alternative of governance. On Thursday, the three forces consolidated the agreement with the signing of a document on the "Platform of Parliamentary Majority Alliance" (AMP), which brings back to the country the debates of 10 years ago when a coalition led by the CNRT - second most voted at that time as this year - led the first MPA to take over the Government. After weeks of negotiations, PLP and KHUNTO eventually rejected being part of the coalition government and the CNRT, whose leader Xanana Gusmao had rejected any coalition and guaranteed stability for the executive, again led an alliance against Fretilin. The Constitution and legislation in force determines that the Government Program has to be discussed for a maximum of five consecutive days and does not even require the document to be voted on. Parliament has scheduled this for the next week. Voting will only take place if the Government submits a vote of confidence - unlikely - or the opposition submits a motion of rejection which will have to be approved by a majority of Members. If this happens - and the rejection motion can be presented at any time during the five days of debate - the Government then has up to a maximum of 30 days to submit a new Government Program that has again five days to debate. If this second program is the subject of a new rejection motion the Government falls. The decision on what happens next is in the hands of the Timorese President who will have to choose between finding a solution within the current parliament or calling early elections. The constitution stipulates that the parliament can not be dissolved within six months after its election, which in this case occurred on July 22, which means that this can only occur after January 22. The following deadlines are dictated by the electoral law that explains that in case of dissolution of the National Parliament, the head of State "fixes, by decree, the date of the election of the Deputies (...) at least sixty days in advance". This deadline is required to comply with all procedures related to the electoral process, from registration of parties to the electoral campaign, and implies that at least early elections can only take place after March 22. In the case of the previous elections of July 22 last, the Court of Appeal only validated the final results eight days later (on August 1) and the members of parliament only took office more than a month later (to September 5), and it is only almost two months after the vote that the government has taken office, and only a month after that the executive's program begins to be debated. The possible rejection motions would postpone the process of eventual adoption of the amending budget for this year and would also condition the debate and approval process of the State Budget for 2018 which, according to the Budget and Financial Management Law, would have to be submitted to the National Parliament until Sunday, October 15, term that can not be fulfilled. Without a State Budget, the duodecimal regime is applied, which means, in practice, that in each month the Government can only spend a maximum of one-twelfth of the Budget of the previous year, in this case 2017. Given the expected electoral calendar, Timor-Leste may have to live with a duodecimal state budget for much of the year, as the entire process - parliamentary takeover, government formation, government takeover, program approval the Government and the State Budget - will take several months. Despite the growing role of the private sector, the public sector in Timor-Leste continues to have a dominant weight in the economy, so prolonging the effects of the major slowdown in public spending this year would be punitive for all economic sectors. Although the state is running day-to-day management in many cases, the poor real budget execution - only 51 percent at the end of the third quarter in a year that was already heavily budget constrained - shows that large investment and large projects will be paralyzed. With several sectors of activity already feeling the effects of the electoral period and the moment of political instability, more delays further amplified these effects.